I made this card a week or so ago. I stamped the veins on the cherry cobbler poinsettia with real red. I like it better a little more subtle. So far this card is my favorite use of the punch. Our twins had a birthday and I needed to make some thank you cards for them. It wound up being more of a general note card for them to write their thanks in but I really like the Happy Scenes stamp set. This is a close-up of the card without the shine of the acetate on the window. It has been a while since I shared a recipe. This recipe came from a sweet friend in Albuquerque. I really like this soup and recently made a double batch to take to a potluck. I ended up using what little soup was left in a turkey chili. 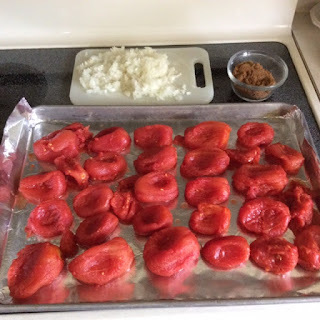 You start of by draining whole tomatoes, reserving the juice and roasting them in the oven. I give the tomatoes a squeeze to get out as much liquid as possible. Sprinkle on some brown sugar and chopped onion and pop it in the oven. When it cools down enough to touch, chop up the tomatoes and put it in the crockpot. I have to say clean-up is a lot easier if you do it straight away and don't let the foil sit. The sugar and juices carmelize and if it goes under the foil the foil will stick to the sheet. Your better off to chop of the tomatoes and get the foil off as soon as possible. 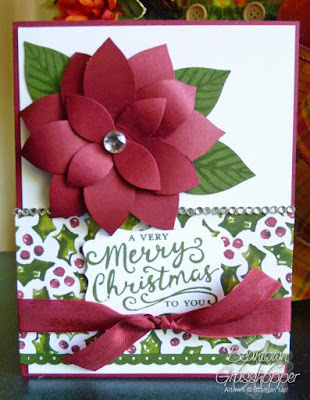 I made 2 versions of this card stamping the flower in real red and cherry cobbler. I like the real red version better. The cherry cobbler matches the berries on the DP more but it seemed a titch too dark. 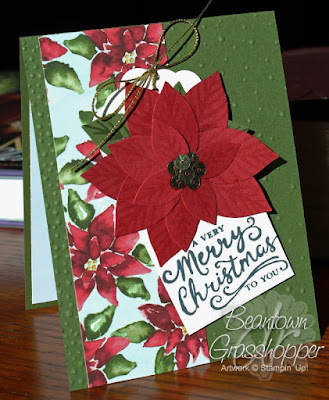 I stamped the leaves on scrap paper before stamping on the card for a lighter color there too. I'm not sure that you can tell from the picture but I used black for the main sentiment, mossy meadow for the swirl and real red for "to you". I envisioned using this flower more on tags or boxes but I wanted to assemble one to see the best way to put it together. I'm OK with how it looks but I want something more on the petals of the poinsettia. I stamped them originally as the leaves are with Real Red on the Cherry Cobbler CS but I wasn't particularly fond of the look so I left them plain. 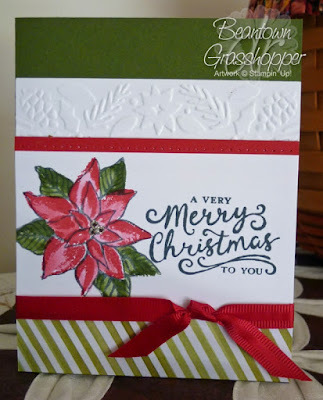 Six years ago we had a stamp set that gave the veiny, texture look of a poinsettia that I would like with this. As flowers go, it is nice. 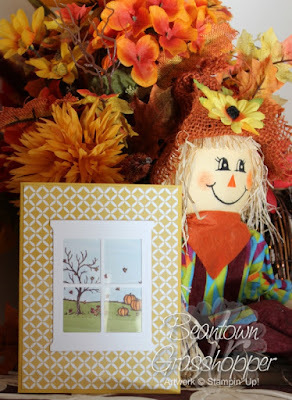 Can you believe that it is October 5th and I'm actually starting my Christmas cards?! How many years I plan to be working on them by now and I really get started in November. This card uses the stamp set Reason for the Season. 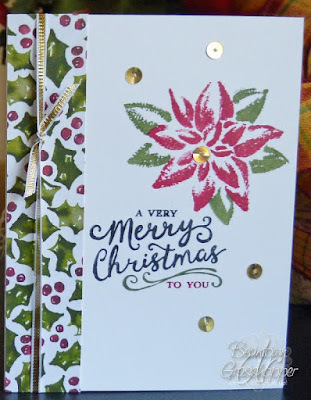 I combined a lot of things I like on this card, embossing, piercing and using the aquapainter. The piercing is hard to see but it is on the red strip above the poinsettia.